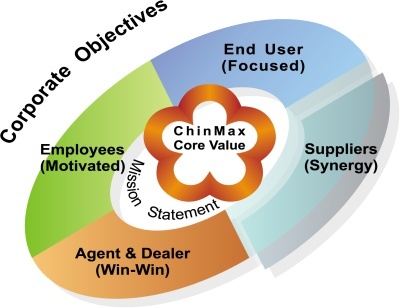 ● Focus on “End-user Centric” service, and to pursue customer satisfaction and success. ● Focus on sales and marketing innovation, find the common collaborative force point in the supply chain and get breakthrough, and to pursue win-win solutions. ● Focus on a consummate working structure & system design and administration, and to support the sustainable and stable sales & market increase. ● Focus on human assets management, respect and trust employees, and to help them actualize their real value potentials.